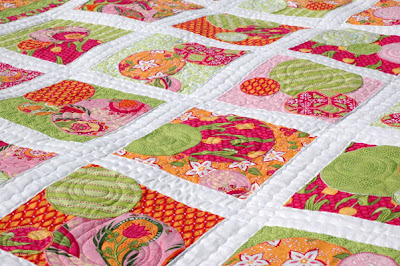 And finally, here is the last of the quilt patterns to debut at Market - Bubbles! 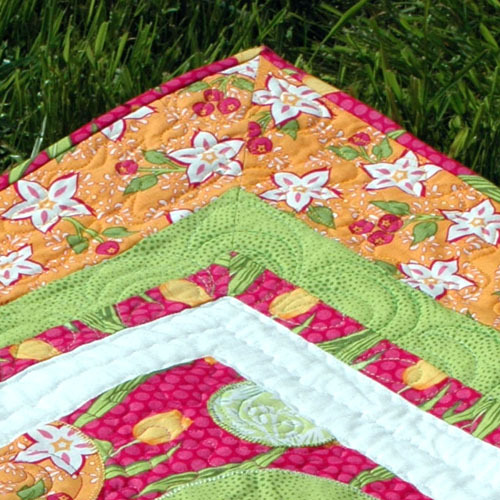 Don't you love the little zigzag quilting on the sashing that Deborah Norris did? Reminds me of ricrac. And the little swirls in the bubbles themselves? Yum! I love Bubbles because it is REALLY fun to make and is a great vehicle to show off those great modern fabrics. I used a thick, contrasting 12 wt. Sulky cotton for the applique, and love how it looks. A few shop owners have remarked that this would be good to use for an embroidery class. One sewer remarked that she was planning on using all the specialty stitches on her machine to attach the circles. Why didn't I think of that? 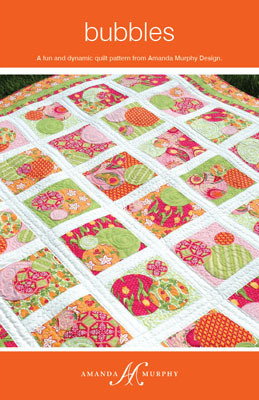 I guess I'll have to make another quilt... Another quilt- that is definitely what every girl needs, don't you think? It is so fun to arrange each block a little differently. I used fusible applique, but you could just as easily use freezer paper templates for a more traditional finish. 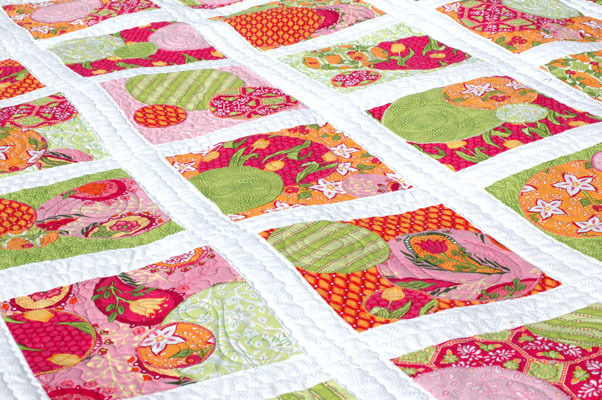 I used the Sorbet color story of Veranda, which ships in August, but Bubbles would make an excellent scrap quilt as well. My friend Mary test-quilted Bubbles for me using Central Park by Kate Spain. She used "Bubbles" in some of the blocks and left others plain. She also mitered corners for the first time, but I'll let her tell you about it. I posted my tutorial for mitering corners online recently, but it is also included in the Bubbles pattern. I just found out this week that my pattern line is being picked up by two big distributors - hooray! I'm very excited about that. Hope you have a happy weekend filled with lots of sewing! Your patterns are at the Fat Quarter Shop!! Just waiting for Veranda to arrive. Beautiful pattern and love the fabrics in it. Congrats on the new distrubutors for your pattern line. Hey there! Thanks for the mention, you sweetie! It was completely my pleasure to stitch this pattern. I finally have the backing fabric and plan to use my leftover circles on the back. I'm so excited! I'll post pics when it's finally finished! What an awesome quilt Amanda. Love the circles and the zig zags are super cute as well. 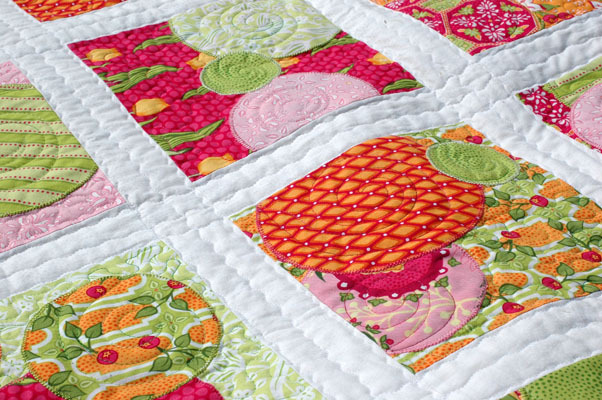 What a happy quilt! 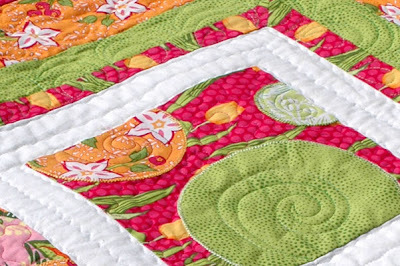 I especially like the swirl quilting in the bubbles. Great pattern, I'll be looking for it at FQS. And bubbles is such a happy name. Congratulations, this is wonderful news! I love your designs and can't decide which I want to try first. Just got my Bubbles Pattern from FQ Shop!!! Need to get busy and finish up some of my other projects so I can make this for my granddaughters 1st birthday. And we'll be having bubbles as party favors too!!! 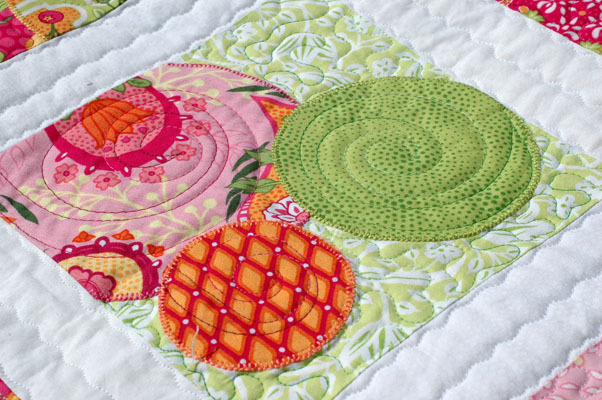 Glad I read the blog today, some great extra ideas for appliquing and quilting!! Yay on the new distributors! Bet that gives you a nice warm feeling :). Love the bubbles pattern and it could be for anyone depending on the fabrics chosen - from babies to grandparents. I just love this pattern. It is so fun. And I love the colors!! I love the Blossoms pattern! I just love pieced backgrounds with applique over top! 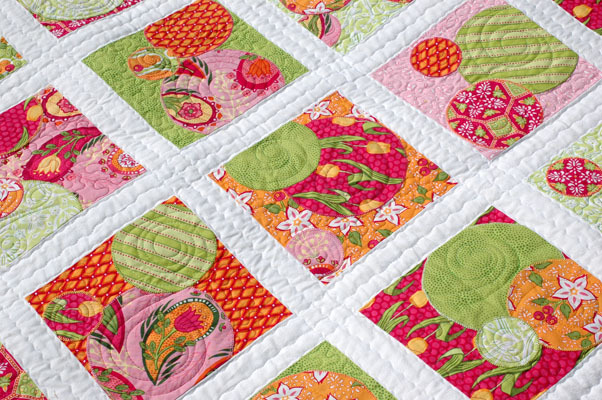 All the quilting on your quilts is SO inspiring! 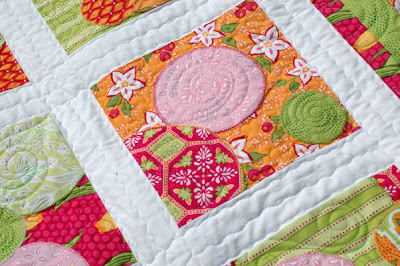 I LOVE LOVE the spiral quilting on this. I saw the pattern on I'm Just a Guy Who Quilts, and then came here and started haphazardly poking around. I loved the pattern and now I love it even more.